Bread has crust. It*s a scientific law of breadmaking. It will have a crust, because it’s got an inside and an outside. And the outside will become crusted in the oven. BREAD CRUST holds a special meaning for Christians, or it should. 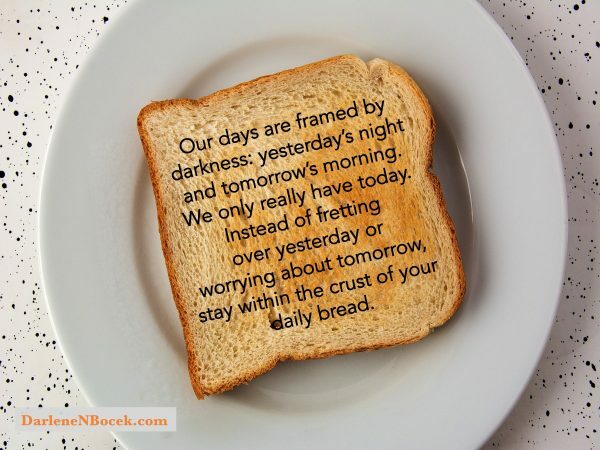 We pray, “Give us this day our daily bread,” and yet we look to tomorrow. We ponder it, worry over it, plan it, hate it, anticipate it, can’t wait for it. We’re always wanting to live for tomorrow, live in tomorrow–almost like the proverbial green grass over the fence. We want to make sure we’ll have tomorrow’s bread. So we worry over making right choices today, double-guessing our decisions today, regretting today and rejoicing in dreams of tomorrow. But all this time we forget that our daily bread has a crust. Just like bread has a crust, days have an edge surrounding them front back and sideways. Jesus said, “Sufficient for the day is the trouble thereof” just after he commanded his disciples, and those listening to NOT WORRY ABOUT TOMORROW. All we have is today, and the grace we are given is sufficient for the day. But as for tomorrow, that belongs to God. Hebrews 4:16 says, “Let us then with confidence draw near to the throne of grace, that we may receive mercy and find grace to help in time of need.” So, in our time of need (our right now) we can draw near and find grace. you cannot BORROW strength or joy or success from tomorrow. But if we are like Martha, busy and concerned about many things, how can we not worry? 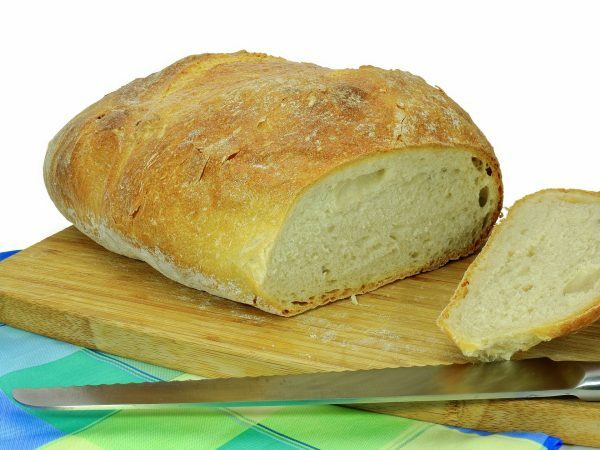 It can help to remember the Bread Crust. So in essence, all bread by nature is going to have a CRUST. It is protecting the rest of the bread, it’s taking the heat and covering the dough. It is sacrificing itself, in a sense, in order to keep the inner bread soft and fluffy. Remember the crust to fight worry over tomorrow. The boundaries around your day protect you from the good, the bad, and the ugly of tomorrow. You have today. You are alive. Today. You have with you today things that make you happy. Yesterday, maybe you had someone or something you wish were still with you today. Tomorrow you maybe hope for someone or something to be with you. But today you have today. You have life, for sure. Today is framed by the darkness of yesterday’s night and the darkness of tomorrow’s morning. Darkness surrounds today. But you have today. This framework is from God. The Bible starts by setting out limits. Light and darkness are limited, day and night, fish and birds. And time. That is, our days are limited. Our days have a crust about them. Delving into tomorrow promises nothing but dissatisfaction with today. It does no good. You don’t know what it holds, but God’s got it all under control. Stay within the crust. Dwelling on yesterday’s failures promises nothing but discouragement with today’s efforts. It does no good. Forgive them. Forgive yourself. Stay within the crust. God defines himself as “Who Was, and Is, and Is to Come.” He encompasses all time dimensions, remains the same through each mode of time. Human beings, however, are limited by today. We shed a million cells a day, so we are always changing. (Not to mention losing 60-100 hairs per day, though God knows how many we have.) We are continually changing, growing, “metamorphasizing.” Tomorrow we are not the same person we were today. Our changeability is one reason Jesus told us to focus on today. We can’t change our height or add a single hour to our life. Next time you feel overwhelmed by the implications of today’s actions on tomorrow, remember that if you do today RIGHT, you don’t need to worry about tomorrow. Let me double the metaphor. 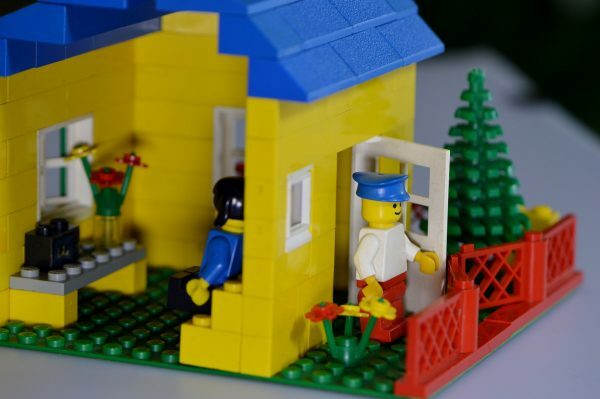 Tomorrow is made up of the little Lego-bricks of TODAYs. So let tomorrow remain in its darkness. And if tomorrow rises up against you like a Shrieking Eel, tell it to get back on the other side of the crust. All the promises of God are yours TODAY. Work on the Brick that is today. Make TODAY the way you want your life to be. And do this one the best you can. To the edge of the crust. Then reap your reward, your daily REST. You will awake to another TODAY.